Our buying guide for the best men’s watches under $300 will show you some of the best bang for your buck watches you can find. As far as specifications you can expect these watches to have features which include water-resistance up to 100 meters, some will have sapphire crystals for scratch resistance, and straps will come in either stainless steel or leather. If you’re looking for an everyday watch you’re sure to find something in this list. Some of our best affordable watch brands include some household names and some you may not be so familiar with. The first watch on the list is by the brand Brathwait and it includes all the top features you’d want in an affordable quality timepiece. 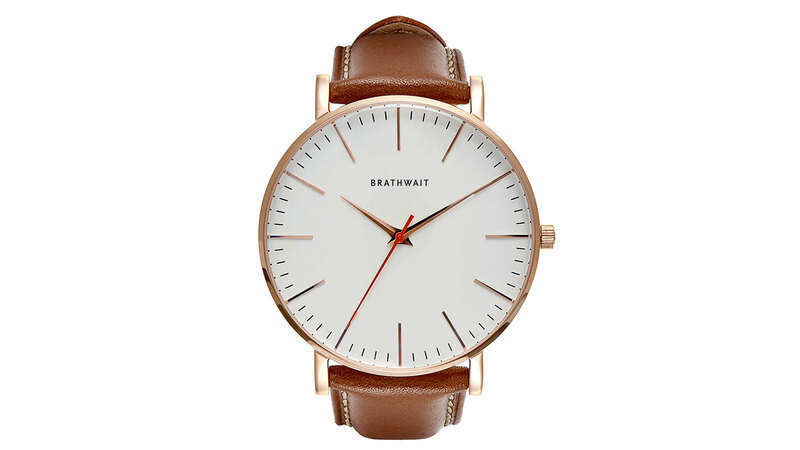 The Brathwait Classic Slim Watch ($249) will look great adorning the wrist of any man and it’s less than $300 in price! With its luxurious, simple and elegant design this stunning minimalist watch is ideal for today’s style concise modern man. The Italian grain leather strap is available in a variety of colors to suit all tastes and it comes packed with an impressive array of fantastic features. Among its features are a smart and simple interchangeable strap function, just a quick flick of a button and you can replace the strap! A 1.9mm thick sapphire glass dome with its own anti-reflective coating, Swiss quartz precision movement and water resistance up to 100 meters in depth. 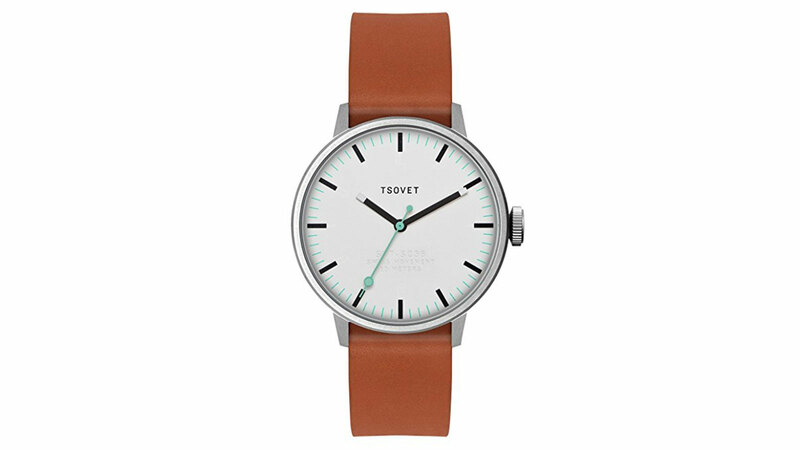 Tsovet is always a name you can trust when it comes to watches as the Tsovet SVT-SC38 Watch ($224) shows! Ideal for the man who prefers things a little more simple this stylish Tsovet SVT-SC38 is a hybrid of simple yet smart design and craftsmanship. It takes a less is more approach and avoids the everyday issue of over-complicated watch design. While the Tsovet SVT-SC38 may be simple and straightforward don’t be fooled into thinking it isn’t an amazing watch! With a mineral crystal face, strong leather band and quality craftsmanship this watch may be simple but it does exactly what you need to it and looks good doing it. It also comes with its own stainless steel case for easy, quick and safe storage. 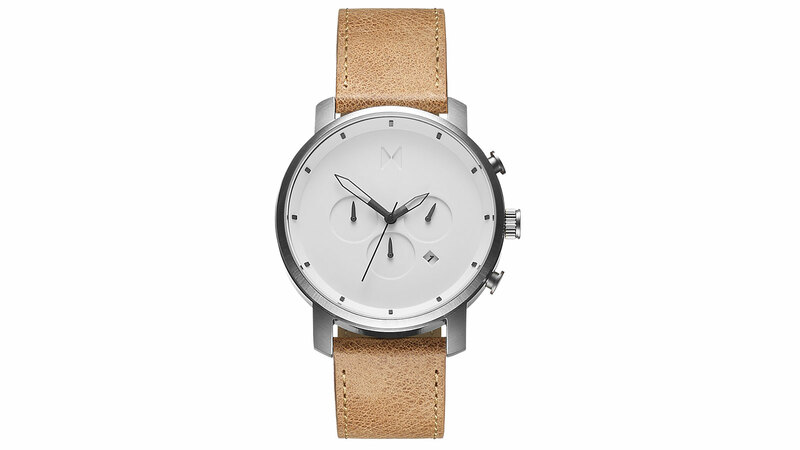 The MVMT Chrono White Caramel Leather Watch ($185) uses stunning contrasting colors to create a stylish modern men’s watch that’s available for less than $300! The metallic design of the watch face perfectly incorporates masculine features that make it perfect for both casual and professional wear. Among the impressive features are a 100% genuine leather strap, silver tone hands and hour markers and a trio of sub-dials. This watch is the whole package and would make a great gift that any man would be sure to love. Simple yet stylish the Mondaine Swiss Railways Giant Watch ($118) is an interesting throwback to times gone by with a design inspired by Swiss Railways. The larger build makes it perfect for people with weaker eyesight and its classic retro design makes it perfect for both watch and train lovers. Its great array of features include: a bold retro design, a 42mm case, Swiss quartz movement, stainless steel construction and it’s also water resistant up to 30 meter. Inspired by the past but perfect for today’s modern man this wondrous watch would make a great gift for any occasion. With its luxurious design you’ll be shocked to learn that the Jack Mason Aviator 3 Hand Watch ($185) really can be yours for less than $300! Available in a range of colors and finishes this premium man’s watch would make an amazing gift and is suitable for both business and casual wear. 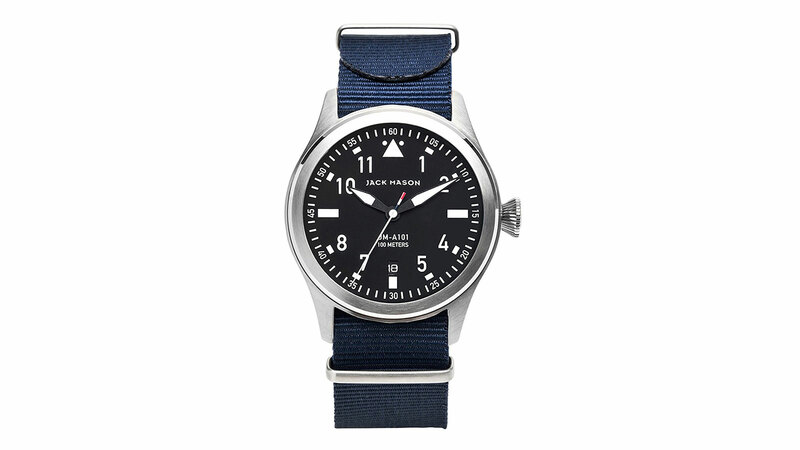 Jack Mason is always a name you can count on for quality and this stylish Aviator fashioned watch would look amazing adorning any man’s wrist. With a thick leather strap, stainless steel construction, highlighted watch hands and much more this watch is sure to become a much loved timepiece. The Daniel Wellington Men’s Watch ($229) is a great dress watch at a great price point. It’s a round rose-gold japan quartz watch. The dial is eggshell white and is topped with a scratch resistant mineral crystal. The 20mm strap is interchangeable and features genuine American leather, that’ll develop a natural patina. The 40mm case is water resistant to 30m (100 ft). It can handle accidental splashes or brief immersion, but don’t take it in the shower or for a swim. Especially with the leather band. The BN0032 by Braun Men’s Watch ($120) is a great looking watch. Just like other watches in this category you can expect a durable mineral crystal, and a quartz movement. Additional features three hands, calendar, and a 40mm solid stainless steel case. It has a water resistance of 50m. You should be able to take it swimming or in the shower. The SGEH67P1 by Seiko Men’s Watch ($122) is a simple sleek watch. This Seiko would make a great everyday wear watch. The case is stainless steel and measures 41mm. It’s topped with a sapphire crystal, which is a nice upgrade for a watch at the price point. The watch displays the hours, minutes, seconds, and calendar day. If you’re looking a minimal dress watch the Everytime by Tissot Men’s Watch ($270) is a great option. The watch features a 40mm 316L stainless steel case with a skeleton case back. The strap is adjustable and features alligator-embossed leather. This is one of the few watches on our under $300 list that has an automatic movement. The movement has a 72 hour power reserve and displays the hour, minute, seconds, and day. The Sapphire crystal is scratch-resistant. And the watch is splash resistant to 30 meters. If you’re looking for a chronograph this watch is your best bet on our list. The Windfall by Swatch Men’s Watch ($152) is a great looking watch but keep in mind it is a Swatch. Which means you’re probably giving up some durability. It comes with a great Swiss-Quartz movement so you don’t have to worry about it keeping accurate time. The water-resistance is on par with others on the list with a 30 meter rating. The two downfalls of the watch are the plastic crystal and the aluminum body. Both are prone to scratches and dings. If you’re looking for an inexpensive daily grind watch the Timex MK1 Men’s Watch ($90) is a great option. It features a class 40mm stainless steel case that’ll hold up under daily use. The quartz movement keeps accurate time and has a three-hand analog display. Viewing the hands at night is easy with the added Indiglo nightlight.